My girlfriend Claudia (who is also my wife) and I arrived in Dublin this past Saturday for our Irish vacation, or as the Irish call it, holiday. We spent two wonderful days in Dublin. We attended church at St. Patrick’s Cathedral, saw a rousing production of “Riverdance” at the Gaiety Theatre, jogged in Stephen’s Green, visited Trinity College, enjoyed a pint of Guiness in a quaint pub, and immediately fell in love with this beautiful country and its people. I am considering changing my name to Bill O’Haltom. And then on Monday afternoon we decided to set out for the Irish countryside. 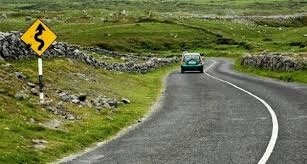 We rented a car, and that’s when our Irish holiday became a sometimes harrowing journey. For the past couple of days, Claudia has enjoyed the scenery of this beautiful green nation as I have chauffeured her in my defective Irish motorcar from Dublin to Limerick to Shannon to the cliffs of Moher, in an Irish production of “Driving Miss Claudia.” I, on the other hand, have not enjoyed the view, as I have spent every minute seated on the passenger side clutching my misplaced steering wheel and constantly reminding myself to stay on the wrong side of the road. (“Left! Left! Left!) Meanwhile, literally thousands of crazy Irish drivers have headed toward me immediately to my right, all speeding down the opposite wrong side, coming within inches of me as they sit on the wrong side of their cars. What makes it even more scary is that “motorways” in the Irish countryside are about the same size as an American city sidewalk, with stone walls rather than shoulders on either side of the road. But here is the good news. Tomorrow Claudia and I are returning to Dublin where I will drive my o’rental car into the wrong side of the terminal and turn it in. For the remainder of my Irish holiday I will leave the driving to Irish cabbies or bus drivers, all of whom seem very comfortable driving on the wrong side of the road behind a misplaced steering wheel. best essay writing service: The next time I read a blog, I hope that it does not fail me just as much as this particular one. I mean, I know it was my choice to read, nonetheless I actually believed you would probably have something useful to talk about. All I hear is a bunch of whining about something you could fix if you were not too busy looking for attention. write my assignment australia: This article is getting to explore Ireland bills from wrong side of the road. That was an amazing opportunity to every user. So they can understood every part of these blogs.